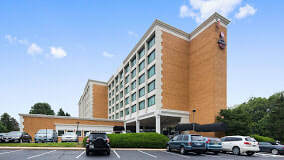 Directions to Rockville, Md Hotel - Michael Rossoff, L.Ac. From 495 towards Rockville and Bethesda>>Take the 270 spur exit, using the left 3 lanes. It will be about 4 exits to Exit 6, Route 28. Be sure and stay in the right Local lanes. Take Exit 6 North (or West). Go about 1 block and the Best Western is on your right. From 495 towards Bethesda, exit onto 270 North. It will be about 4 exits to Exit 6, Route 28. Be sure and stay in the right Local lanes. Take Exit 6 North (or West). Go about 1 block and the Best Western is on your right. Go north on Rockville Pike to Route 28, turning onto East Jefferson Street. Use the left turn lane to go onto E. Jefferson Street and continue less than a mile going under Route 270. Continue of Route 28, which now changes names to W. Montgomery Avenue. You should see the Best Western on your right.